This classic crowd-pleasing shrimp boil comes together in a few minutes and is the perfect dish for a warm-weather meal with friends and family! No cleanup, you can make it ahead and totally delicious! This post is sponsored by Reynolds Wrap. I was excited to work with them since I love their products and use them almost every day! 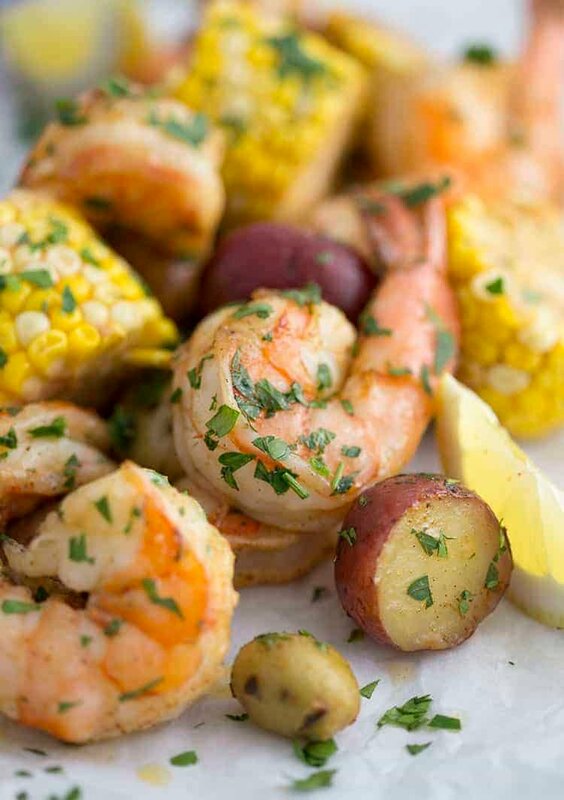 What do you eat with shrimp boil? Shrimp boils are almost complete meals but they’re wonderful with a salad or some biscuits! Take a look at these recipes and see what strikes your fancy! 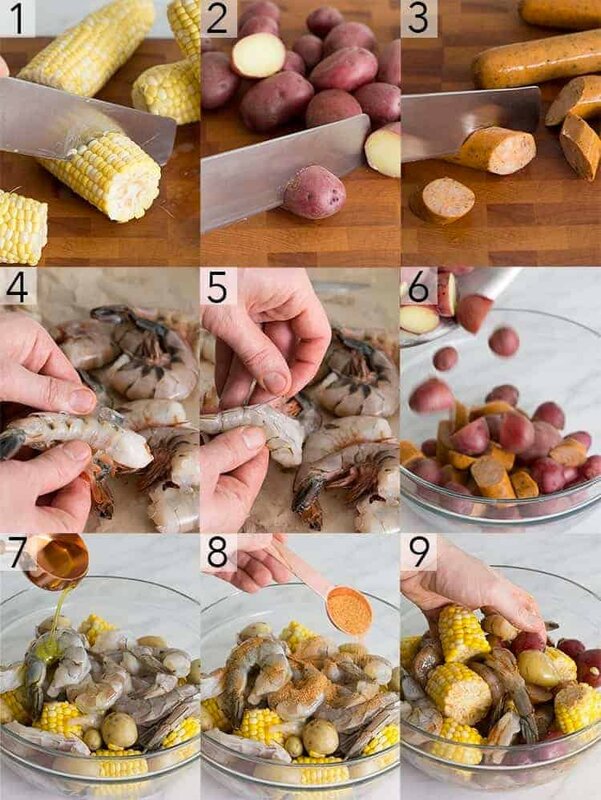 How long do you let shrimp boil? Shrimp cook really fast! This is why we parboil the potatoes to give them a head start in the baking. 2-3 minutes is how long to let shrimp boil. You can keep an eye out for color change which will let you know when the proteins in the shrimp have denatured and it is cooked. Can you boil frozen shrimp? Always thaw shrimp before cooking no matter what the method. Overcooking shrimp ruins the texture and if you try to cook frozen shrimp the cook time needs to be dramatically increased to cook them through. How much shrimp do you need per person? You should plan on at least a quarter pound or 4oz of shrimp per person. Up that amount for shell on shrimp, shrimp lovers and when your recipe is delicious because people will want more even if they aren’t hungry! You don’t HAVE to devein shrimp but it’s a good idea, especially for larger shrimp. The vein can alter the taste of the shrimp and it’s not visually appealing to see when you bite into. This is less of an issue with smaller shrimp but at the end of the day it’s more about your personal taste than food safety. 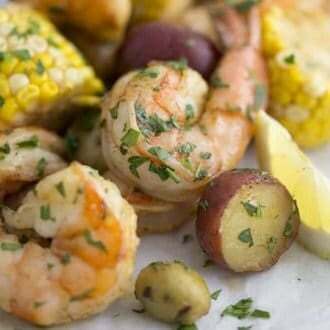 How do you make this shrimp boil recipe? Boil corn in water for about 2 minutes or until brighter in color. cut into about 2 inch thick pieces and set aside. Boil potatoes for about 10 minutes. Any larger potatoes can be cut in halves or quarters. Cut sausage into 1 inch thick diagonal slices. Devein shrimp by making a shallow cut along the back and removing the dark vein. Add sausage, potatoes, corn and shrimp to a large bowl. Place a few cups of the shrimp boil onto a 16 inch length or Heavy Duty Reynolds Wrap. double fold the two remaining sides. Repeat process until all the filling is gone. Place on baking sheet and bake at 425F for about 10 minutes. A drizzle of melted butter mixed with some of the cajun spices id definitely optional but SO worth it in my opinion. You can’t beat a little butter! Test your seasoning first! Some are not salted and will need more salt to taste while others can be very salty. 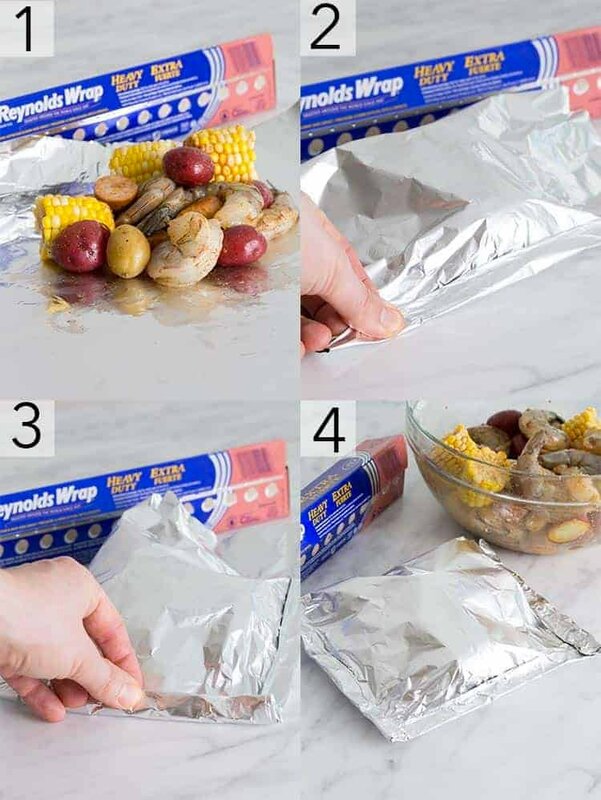 Make the packets ahead of time so you can toss them into the oven when guests are about to sit down. For the most tender shrimp make sure to cook your potatoes and corn first by boiling them. Then bake the packets for 8-9 minutes. Don’t over-pack your packets. The shrimp in the center of your stuffed packets will not get enough heat to cook. use a favorite seasoning for this dish and you’ll love it. Old bay seasoning, Creole seasoning and many seafood seasonings will work well with this dish. 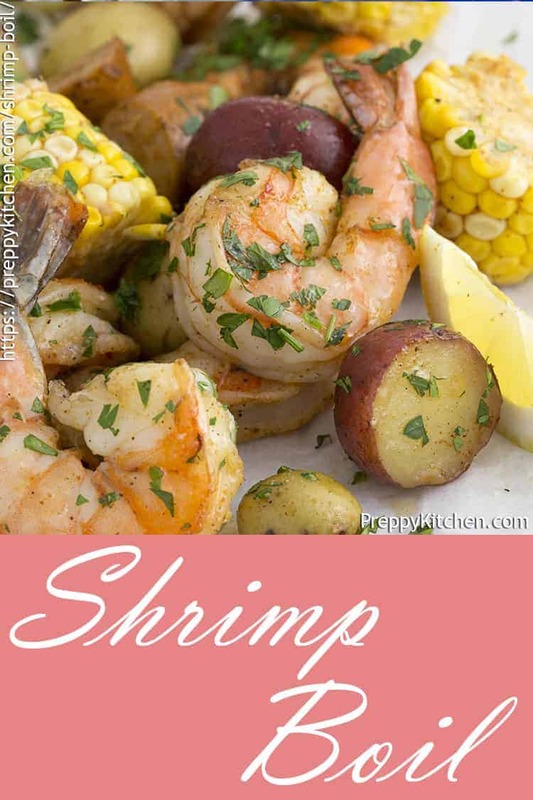 If you’ve tried this shrimp boil recipe then don’t forget to rate the recipe and let me know how you got on in the comments below, I love hearing from you! 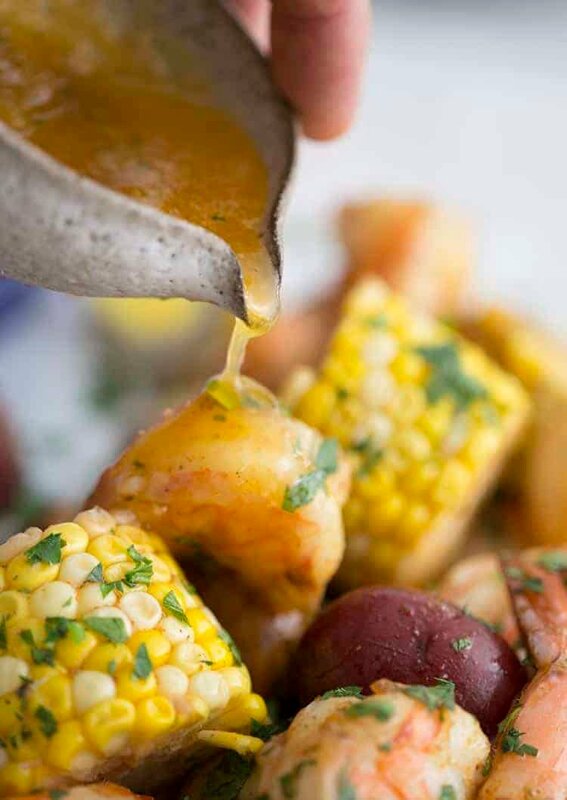 This classic crowd-pleasing shrimp boil with sweet corn, creamy potatoes and spicy sausage comes together in a few minutes and is the perfect dish for a warm-weather meal with friends and family! Preheat oven to 425F. Add baby potatoes to a large pot of boiling water and cook for about 10 minutes or until softened. Add corn to boiling water and cook for a few minutes until the color brightens. Remove from water and set aside. Cut corn into 2 inch long pieces. Cut sausage into inch thick slices. Remove shells from shrimp and devein. Add potatoes, corn, shrimp and sausage to a large bowl. Drizzle with olive oil and sprinkle with seasoning. Toss well. Cut 16 inch long sections of Heavy Duty Reynolds wrap foil. Place about 2 cups or so of the shrimp mixture onto a section of foil. Double fold the end, leaving room for heat to circulate inside. Double fold the remaining sides so the pouch is sealed. Repeat process for the remaining material. Place on a baking sheet and bake at 425F for about 10 minutes. Mince parsley. Meld butter with 1/2 tsp of the cajun seasoning. Serve sprinkled with parsley and drizzled with butter. Don't over-pack your packets. The shrimp in the center of your stuffed packets will not get enough heat to cook. use a favorite seasoning for this dish and you'll love it. Old bay seasoning, Creole seasoning and many seafood seasonings will work well with this dish.